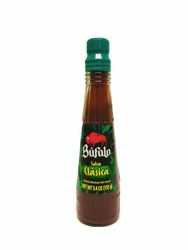 Hot Sauce - Salsa Picante Clasica by Bufalo - Hot 5.7 oz. Hot sauce made with chiles and spices, also called Mexican salsa picante. Bufalo Classica style. Mexico's favorite hot sauce. Turn on your taste buds with the intense spicy flavor of the Guajillo peppers in Bufalo Classic Style Hot sauce. If you want to add a rich flavor and a little kick to your meals and recipes, then the Classic Style salsa is ideal to give your favorite dishes and snacks that special touch. Add Zing and flavor to your dishes, with out fat or calories. 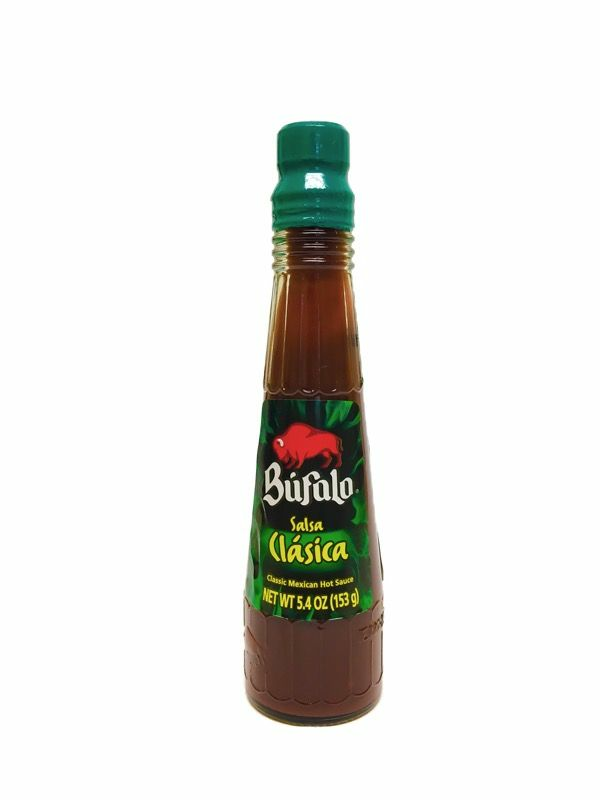 Bufalo Classic Style hot sauce is made with mild guajillo peppers and spices, offers balanced heat with a delicious hint of lime. This is Mexico's favorite and most common style of hot sauce. Ingredients: Water, Acetic Acid, Guajillo Peppers, Iodized Salt, Sugar, Xanthan Gum, Condiments, 0.06% of Sodium Benzoate (as preservative), F.D & C Red 40 and Dehydrated Garlic. Salsa roja picante Bufalo picor mediano con chiles y especias.. Conocida com la salsa clasica de Bufalo. Classica. Deja que el intenso sabor de los chiles guajillos de la Salsa Clasica Bufalo prendan a tu paladar. Si quieres darle un delicioso sabor y un toque a sus platillos y recetas, entonces la salsa Clasica es ideal para para darle sus platillos y botanas favoritas ese toque especial. Dale sabor a tus platillos, sin grasa ni calorias. La Salsa Clasica Bufalo esta hecha con guajillos suaves y especias, ofreciendo un picor balanceado con un delicioso toque de limon. Esta es el estilo de salsa favorite en Mexico conocida como la salsa clasica de Bufalo. Classica. Ingredientes: Agua, Acido Acetico, Chiles Guajillos, Sal Yodatada, Azucar, Goma de Xantano, Condimentos, 0.06% de Benzoato de Sodio (como conservante), F.D & C Rojo 40 y Ajo Deshidratado. I am a big fan of the guajillo pepper and would welcome any other recommendations from your company. My favorite "go to" hot sauce. Although not really hot, it has the best flavor of any sauces that use. (And I use a lot of sauces). ProsThe best flavor of any sauce that I use. Thanks mexgrocer.com. It is best for watching game of Necaxa!!! Gooooooool! Discovered this in a restaurant outside of Raleigh, NC. Extraordinary! And, now a household staple. ProsJust the right amount of heat, tart enough to serve as a counterpoint for beans or meat, and has real flavor! This is the only sauce I always go back to. I am very happy that you have it now here. Best hot sauce on the planet!! !